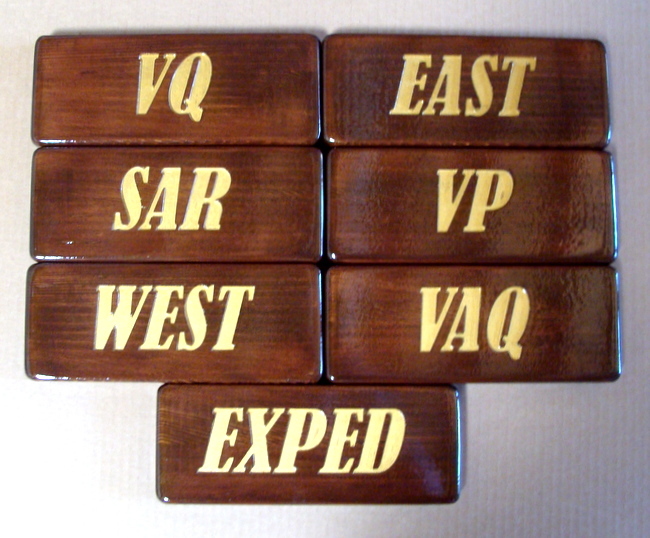 Shown above are carved naturally-finished Redwood room name plaques for a lodge. These rustic room number plaques features engraved text and dark stained Redwood. These plaques and similar ones can be made of painted High-Density-Urethane (HDU) or stained and painted wood of various species (e.g., Redwood, Cedar, Oak, Maple, Mahogany, Cherry) . The text on these plaques are hand-painted metallic gold and are clear-coated twice. These room name plaques can be easily mounted on an outside wall ,a door, or an inside hall wall next to the room door.